In October 2010, the Queen welcomed the Emir of the State of Qatar, Sheikh Hamad bin Khalifa Al-Thani, and his glamorous wife Sheikha Mozah Bint Nasser Al-Missned to Windsor Castle for their state visit to the United Kingdom. That evening's state banquet featured pearls for the Queen: the Grand Duchess Vladimir Tiara, the Qatar Pearl and Diamond Demi-Parure (earrings and necklace, a previous gift from the Emir's father), the Pearl Evening Watch, and Queen Mary's Pearl and Diamond Floral Bracelet. Her long golden chain is Qatar's Collar of Independence. 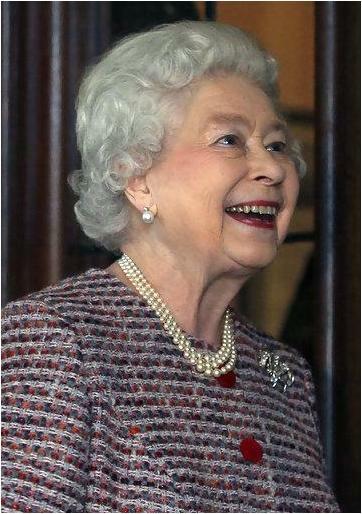 Other spotted bling includes the Greville Tiara on the Duchess of Cornwall, the Meander Tiara on the Princess Royal, and the Countess of Wessex with her wedding tiara. Finally, the Queen bid her guests farewell at the end of their visit in one of Queen Victoria's Bow Brooches. This was a jolly visit, really - the Queen and the Duke seem to enjoy their Qatari friends each time they meet. The Emir has since abdicated in favor of his son. 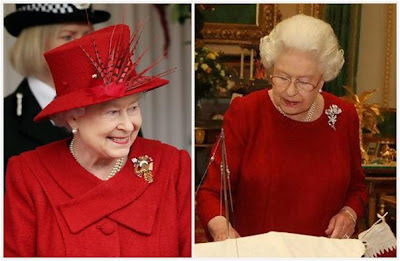 In other news... the Queen was spotted going to church this past Sunday in the Flower Basket Brooch, and the previous Sunday in what I'm thinking must be the Pearl Trefoil Brooch (and perhaps my least favorite color, too).